Special dogs need special people. We have dogs with various needs and special requirements, as well as ‘ordinary dogs’ free of health and behavioral issues. But this they have in common: the capacity to enrich the lives of those with whom they share their eventual ‘forever home’. And in this you can be confident: Camp Basenji will be with you every step of the way—both through the adoption process and in addressing any challenges you and your best friend encounter down the road. 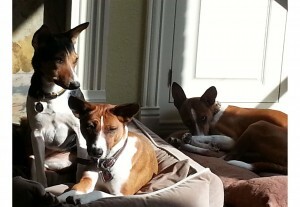 If you are interested in becoming the special person in the life of one of our Basenjis, start by completing our adoption form. Upon receiving your form, we will contact you to discuss your interest and potential adoptees as well as schedule a home visit. Following the home visit we will connect you with adoptee foster parents and provide you an opportunity to meet your potential new best friend. And once we have confirmed we have a good match for you, we coordinate logistics with you for your new dog’s homecoming. Adopt today!